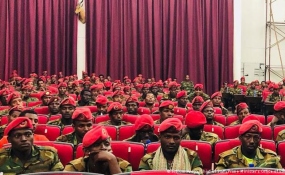 Ethiopia Soldier Strike - Disloyalty or Democracy? Carefully identifying the capable young leaders that would succeed the current ones contributes a great deal in ensuring the proper continuity of leadership within a party. This what the Oromo Democratic Party (OPD) did last week. At a conference attracted more than 6,000 participants, the party retired 14 long-serving officials by consolidating the position of the young generation. The decision of the party is timely and proper for it is done in response to the demands due to the strategic change. The decision is also the exact indication that the party is on the right path to sustain the ongoing reform. It was last week, after 28 years, the party rebranded itself to the Oromo Democratic Party from the Oromo Peoples Democratic Organization (OPDO) on its 9th regular summit at Jimma town. Besides changing the name, it also introduced a new logo and anthem. These changes are to reflect the new flourishing chapter the party has achieved. OPDO, as one of the four member parties of the ruling coalition in Ethiopian People’s Revolutionary Democratic Front, has been demonstrating a remarkable leadership in changing the long-standing political landscape. In the last four years, the party has accomplished a great deal that ensures the benefits of the community in the state. Among these, it created job opportunities for more than 2.2 million youths last year. It took decisive measures to control rent seeking activities related to land administration and management and the like. Thus, rebranding the name, the long and anthem is very convincing and appropriate decision to demonstrate the considerable changes the party has experienced. The party stated that it brought the capable young leaders to the front believing that they can meet the prevailing diversity as well as emerging leadership needs across the nation. Though the retiring leaders possess 28 years experiences, it seems that the current political reform obliges them to hand over their positions to more capable, energetic and motivated individuals. It is also believed that unlike their long-service in the party, they lack commitment to accelerate the ongoing reform. A glance at the circumstances of the country in over a couple of decades indicates the prevailing of deep-rooted leadership problem. Thus, basic change on the existing system and replacing it with well cultivated leadership is so crucial. Next, encouraging young leaders would help the party to systematically handle the challenging situation in the region it represents, Oromia State. The rising political, economical and social needs of the young generation in the state necessitate strategic leadership in order to deal with. Here, skillful young leaders who are capable enough to influence the generation ought to approach the youth. The state leadership has been struggling with the rising demands of the youth particularly in the last four years. Hence, bringing the young leaders to the front may reduce the extent of the problem. Moreover, there is a consensus among the party members that the young people are more comfortable with the current reform. They can align themselves with the circumstances to accelerate the ongoing reform. Hence, giving more chances for the young leaders would support the intended output of the reform. In short, OPD has taken conscious decision to implement leadership succession that would improve its leadership to meet the emerging leadership demands. It has to proactively and effectively plan for leadership transition instead of waiting for more than a couple of decades accommodating the old leaders. Through carefully identifying the priorities and challenges facing it in the course of sustaining the reform, the party ought to continue recruiting potential future leaders through discerning their talents and skills and investing in them in constant development. Other coalition parties should learn this lesson. This process would ensure the continuity of leadership and reduce the skills and talents gaps may arise.